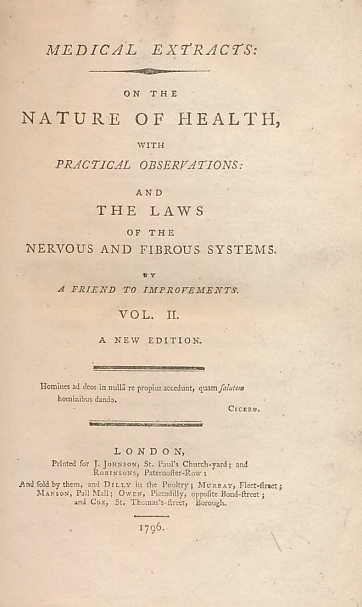 Barter Books : A Friend to Improvements [Thorton, Robert John] : Medical Extracts: On the Nature of Health, with Practical Observations; and the Laws of the Nervous and Fibrous Systems. Volume II. London: J Johnson; Robinsons; Dilly; &c.
200 x 130 mm (8 x 5 inches) - [lxxiv], xlvii, 200pp. G: in good condition. Cover heavily rubbed. Hinges cracked. Eps soiled. An early study into direct and indirect nervous stimuli and consequential physcological results. Most sections are illustrated with literary or poetical examples. The 2nd book of a 4 volume set. Dedication to Dr Darwin.